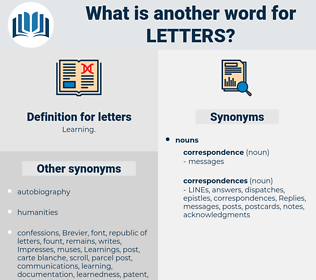 What is another word for letters? protocols, speeches, Records, notes, memos, remarks, equivalences, nations, declarations, returns, ietters. Les, declarations, sheets, consignments, Leaves, lettres, capitals, sections, returns, SMS, paragraphs, bills, correspondence, letras, literature. alphabets, scripts, endorsements, characteristics, notifications, representations, purposes, responsibilities, Replies, digits, agreements, Abbreviations, phrases, texts, Telecommunications, passports, documents, e-mails, circulars, lists, Characters, memoranda, Memorandums, titles, attestations, Addresses, materials, complaints, signals, envelopes, symbols, requests, expressions, fonts, disclosures, presentations, Languages, tables, proposals, formulations, particulars, Mails, litres, arrangements, sets, wordings, attributes, parcels, transfers, affidavits, Emails, protocols, Pleadings, cross-references, airlines, closures, collections, covers, announcements, Certifications, applicants, Journals, matters, speeches, threats, Copies, Cells, messengers, estates, professions, skills, Italics, commitments, submissions, notices, Regulations, releases, Rifles, baselines, indications, interchanges, allegations, Legacies, files, Areas, routes, banknotes, couriers, directions, clearances, footnotes, warrants, mailboxes, mailings, Entries, Records, notes, memos, passages, worshippers, initials, lyrics, Qualities, postings, installations, publishers, trades, Patents, indents, remarks, items, readers, advisories, notations, positions, types, crafts, subsections, answers, processes, equivalences, Undertakings, licences, orders, pipelines, Textbooks, bulls, posts, tickets, committees, mentions, markings, Occupations, defendants, tenders, counterparts, connections, dimensions, Shots, responses, pieces, commissions, reminders, acronyms, annotations, ratings, believers, hits, applications, traits, points, awards, Las, grades, Forms, demands, Maps, signs, opinions, recoveries, exchanges, features, charts, packages, powers, claims, actions, accords, caps, Parties, mappings, nations, Motions, figures, offices, declarations, sheets, correspondences, consignments, lettres, capitals, sections, credentials, returns, SMS, paragraphs, bills, correspondence, ietters, words, written, writings, papers. dispatches, believes, hits, charts, lettres. She wrote him two letters and he wrote her one. How in the world did you teach'n his letters, child? 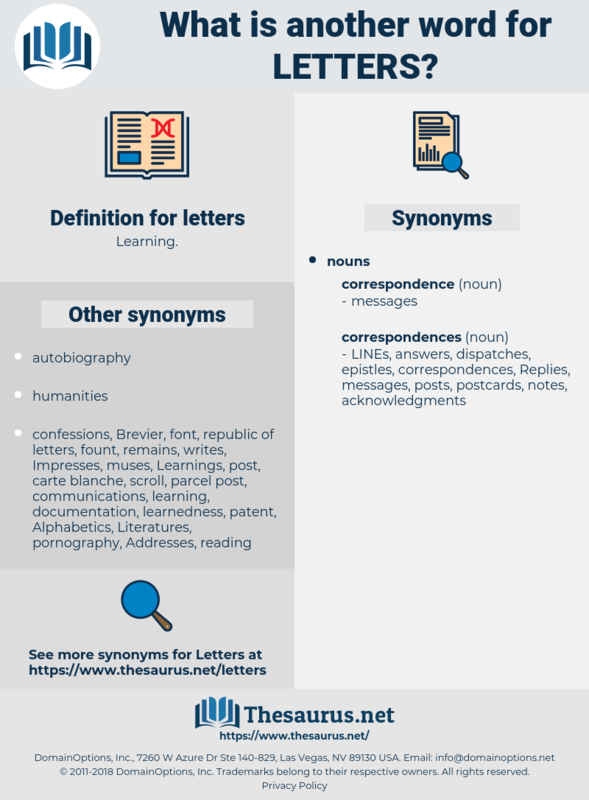 leaders, literary work, lethargic, letter z, lythraceae, leatherwork, lethargy, letter x, letter c, liturgy, lithuresis, letter j, lathyrus, letter q, letter k, letter g, literacy, leatherjack, liatris, letter case, literary hack, letter s, liturgics. erudition, culture, learnedness, eruditeness, Encyclopedism, scholarship, learning, encyclopaedism.